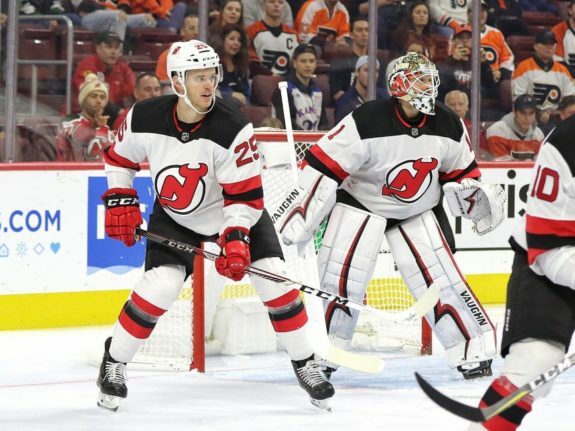 The New Jersey Devils have been two wildly different teams at home and on the road this season. They have a 5-1-1 record at the Prudential Center but have won just one game in six tries on the road. What have been their main issues? And can they fix things before the season becomes a lost cause? Why Has It Gone South on the Road? There are good reasons why the Devils results have struggled on the road. In seven home games, they’ve outscored their opponents 26-15 but have been outscored 16-28 in six road games. They’ve also been outshot 192-207 on the road but have outshot opponents 225-210 at home. The Devils struggles at five-on-five have played a part in the worse results. They have a minus-three shot attempt differential at home, which isn’t terrible. However, that number jumps to minus-37 on the road, which gives them the 10th-worst road Corsi For (CF%) in the league. It’s not just shot attempts where the Devils have struggled. They’ve also had trouble maintaining a positive scoring chance differential. At home, they’ve out-chanced their opponents 146-133 but have been out-chanced 125-139 on the road. If there’s one area where the Devils have found success, it’s in their high-danger chance ratio. They have the best high-danger chances-for percentage (HDCF%) in the league at home (66.32%) and the second-best HDCF% on the road (56.9%). That could help turn things around moving forward. Part of this is related to the players’ performance in front of them, but the Devils’ goaltending has been noticeably worse. They have sixth-best five-on-five save percentage (SV%) at home but have the ninth worst on the road. The team’s SV% on scoring and high-danger chances has taken a hit, too. Their high-danger save percentage (HDSV%) on the road is 82.05%, ranked tenth-worst in the NHL. However, they have an 86.96% HDSV% at home, which is the eighth-best in the NHL. The difference is similar in their scoring chance save percentage (SCSV%). They have third-best SCSV% at home but have only the 19th-best on the road. Keith Kinkaid or Cory Schneider can’t take 100% of the blame for underperforming. The team hasn’t been able to control shot attempts and scoring chances, which has made life difficult for either goalie. At the same time, they can help their own cause with a couple of strong road performances to help bail the team out. 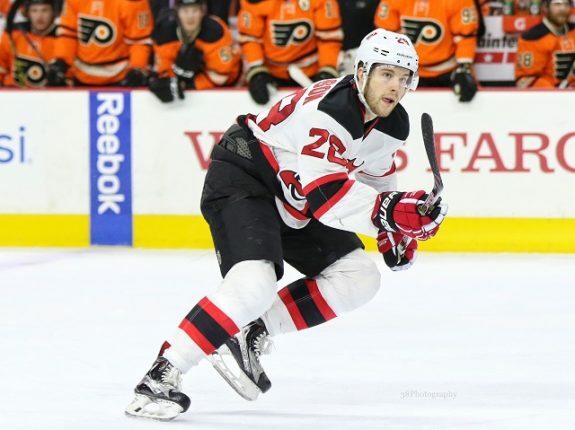 The Devils blueline has had a rough go of it away from New Jersey. The two performances that stood out most were losses against the Tampa Bay Lightning, where New Jersey gave up eight goals, and the Ottawa Senators, where Mark Stone tallied five points. In both games, the Devils took a 2-0 lead but quickly unraveled because of poor defensive performances. They had trouble making passes to get out of their own end and were giving too much time and space to opposing shooters. Devils head coach John Hynes spoke about the team’s effort after the 7-3 loss to the Senators. “It’s that simple. It’s that simple,” Hynes told Abbey Mastracco of the North Jersey Record. “I mean, look at the games. Look at the games we’ve won versus the games we’ve lost. You can’t win in this league if you don’t have a competitive effort on the puck and do the right things. That’s where it’s at.” (from ‘How to solve the Devils’ ‘yo-yo’ problem’, North Jersey Record – 11/6/18). 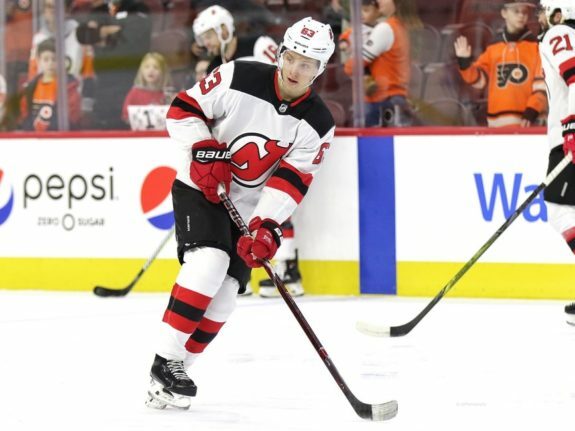 The team’s top line of Taylor Hall, Nico Hischier, and Kyle Palmieri has been fantastic, but the Devils need to get much more from their other three lines. Pavel Zacha’s poor start to the season hurt the team, while Marcus Johansson has also struggled out of the gate, with just five points in 12 games. Fortunately for the Devils, reinforcements are on the way. Jesper Bratt is set to return to the lineup on Friday night and will play top-six minutes right away. He’s not the solution to all their problems, but he will give New Jersey another scoring threat up front. Stefan Noesen is also close to returning from an injury and helps give the Devils depth in their bottom six. Drew Stafford has played in his place but has no points in five games with just seven shots on goal, which isn’t good enough, even in a depth role. Bratt and Noesen also give Hynes more options to mix up his lines. It’s too soon to break up the top line, but Bratt’s had success with Hall and Hischier in the past. That would move Palmieri off the first line and could help give the Devils better balance up front. The Devils struggles on the road could not have come at a worse time. Eleven of their 15 games in November are away from New Jersey. If they don’t start getting better results, they could begin December facing an uphill climb. From 2011 to 2017, 78% of teams in a playoff spot by American Thanksgiving ended up qualifying in April. There are now less than two weeks to go until Thanksgiving. The Devils are at the bottom of the Metropolitan Division but are only separated from first place by five points. Being in a playoff spot on Thanksgiving doesn’t guarantee a spot in April, but those are odds you want on your side. The Devils have the same pieces from last season’s playoff appearance, so the talent is there. They’ve shown that in their performances at home. If they can play the same way on the road, they can turn things around. But it has to happen now, or it will end up costing them.